This year, treat your travel bucket list like your office to-do list and tackle the timeliest items first. That means sailing through Brazil’s jaguar-filled (and newly luxurious) Pantanal while everyone else heads down the Amazon, and skipping overdeveloped Bali in favor of Bodrum, where a five-star-resort renaissance is under way. Those are just two of twenty-plus destinations to prioritise in 2019, all chosen by our trend-spotting editors and global correspondents for their so-hot-right-now status. Among their draws: skyrocketing cultural cachet, major hotel openings, and new restaurants worth traveling for. To help you get the most bang for your buck, we’ve accompanied each recommendation with exclusive data from Google and tips from our favourite travel specialists. As we’ve learned before, the ideal time to travel isn’t always related to cost. Start packing: it's going going to be an exciting year ahead. More luxury options and a newly expanded airport mean Bhutan is no longer a bucket-list stop for only the temple-gazing crowd. Take the six-month-old, 22-room, all-inclusive Bhutan Spirit Sanctuary: Its wellness-oriented programming focuses on yoga, meditation, and spa treatments that employ foraged medicinal herbs. If that hotel’s goal is to leave guests with a restful mind, safari operator &Beyond is catering to those with restless legs. At its forthcoming riverfront camp in the lush Punakha valley, travelers will spend their days kayaking the Mo Chhu River’s crystal-clear waters and hiking past rice paddy fields punctuated by ancient fortresses. These newcomers offer a more immersive experience than Bhutan’s long-established luxury circuits, which shuttle guests around a half-dozen Como or Aman Resorts hotels scattered throughout the country. But if that type of broad overview is what you prefer, try the new lodges from Six Senses Hotels—they’ll open by summer in five special locations secured through connections with the royal family. You won’t find crowds: A nationwide, $250-a-day visitor fee helps keep tourism numbers blissfully low. When to go: In the off-season—mid-November through February—hotel occupancy drops, the post-monsoon skies are clear, and the black-necked cranes return to the Phobjikha Valley for the winter. In the spring, the rhododendron forests burst with color and the weather is mild. When not to go: Showers and misty skies can obscure mountain vistas in the summer months. And the influx of travelers over the last few years has created two distinct peak seasons: April and October. 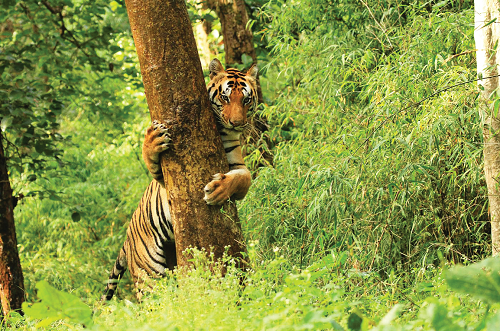 India is making great strides in conservation. The subcontinent is home to the largest population of wild tigers, whose worldwide numbers dipped to just over 1,400 in 2006. But with new reserves and better education, those numbers are expected to top 3,000 when the next Bengal census is released later this month. For travelers, that means sightings have gone from being unreliable to almost guaranteed—particularly in Madhya Pradesh, an 80-minute flight from Mumbai. Not only does the state have more protected parks than neighbouring Rajasthan, but it’s also less crowded. And new mobile camp experiences promise to take guests deep into the wild. The Jamtara Wilderness Camp uses African-style tents with refurbished wooden flooring and materials have been locally sourced and recycled. The wooden flooring come from shipping docks, the writing desks from the Supreme Court of India. When not to go: It starts getting warm in mid-April, and the national parks are closed during monsoon season, from June to October. Whom to call: Amit Sankhala at Encounters Asia and owner of The Kanha Jungle Lodge, Bandhavgarh Jungle Lodge, and the Jamtara Wilderness Camp. With roughly a third as many international visitors as Thailand, Vietnam is often left in the shadow of its popular neighbor. But the country has seen a 30 percent surge in tourists in the past year, with many of them are flocking to Vietnam’s 2,000 miles of tranquil, powdery coastline. At the month-old Anantara Quy Nhon Villas, midway between Ho Chi Minh City and Da Nang on the less-traveled central coast, guests can take in panoramic views from one of 26 ocean-facing bungalows. Farther south, the JW Marriott Phu Quoc Emerald Bay Resort & Spa is a tropical retreat on a former prison island, now with a protected national park. Most peaceful of all will be Legacy Yen Tu, a resort in a once-abandoned village in the Dong Trieu mountains near the limestone cliffs of Ha Long Bay. Painstakingly re-created by architect Bill Bensley, it opens in January with a Japanese onsen-inspired spa and a museum chronicling the area’s rich Buddhist history. When to go: December, before the Christmas rush. Rainy season is ending (though it may still drizzle in Hanoi), the temps are cool, and the crowds have not yet descended. When not to go: Christmas, Easter, and Vietnamese New Year (in early February) can be quite crowded. And if you’re heading to central Vietnam, skip October: it’s typhoon season. If you don’t have the flexibility for a long trip but have always wanted to watch 1.7 million wildebeests thunder across the Maasai Mara, this is the year to realize your wildest dream. A new nonstop route on Kenya Airways from New York’s JFK to Nairobi makes the country’s charms— witnessing the Great Migration, shopping for elaborate beaded jewelry, and riding camels in the desert—more accessible to East Coasters than ever. The 14-hour flight lands in the capital in the morning, so you can make it to your safari camp in time for lunch and an afternoon game drive. An hour by plane from Nairobi, you can be at the new Sanctuary Olonana, whose 14 glass-walled suites have wide decks facing the Mara River, or &Beyond’s recently rebuilt Bateleur Camp, where you can watch elephants graze while you bask in a crescent-shaped infinity pool. Or skip the savannah altogether and head for Kenya’s beaches, which are less developed than Zanzibar’s or Mozambique’s. Lamu—an island with a Unesco-protected, 14th century Swahili village and colorful sailboats lining its harbor—is an underrated favorite and well worth the extra (short) trip. Get there fast: Just like Nairobi, the beach destination is benefiting from increased and affordable air travel, and crowds are sure to follow. When to go: September, after the crowds have gone but while the migration is still crossing the Mara. January and February also rank high as a time to spot newborn wildlife. When not to go: April and May. Rain makes the roads hard to navigate. Also avoid overcrowded July and August. Amid the dense tangle of skyscrapers in Hong Kong, two entirely new neighborhoods are emerging. On the east end of Tsim Sha Tsui in Kowloon is the $2.6 billion waterfront development known as Victoria Dockside, a burgeoning arts and design district transformed by the architects of New York City’s High Line. The Avenue of Stars that snakes around the development reopens in February, but the precinct will come of age when the 43-floor Rosewood Hotel opens in March. From there, a five-minute Star Ferry ride to the Island side of the city takes you to the 170-year-old police compound of Tai Kwun, which has been reborn as a vibrant cultural zone with the debut of the JC Contemporary art gallery and JC Cube theater last summer. The must-try stops: Dragonfly, a cocktail lounge with stained-glass windows; the Armoury rooftop bar with its views of the city’s neon skyline; and Old Bailey, a restaurant that spotlights Jiangnan delicacies such as Hangzhou smoked pigeon. When to go: For idyllic, mild temperatures—still warm enough to visit the city’s outlying islands—plan for spring or fall. Or go the super-festive route and travel during Chinese New Year, which lasts from late January to early February. When not to go: July and August are hot, humid, and often wet. Also be wary of Chinese national holidays, when tons of domestic visitors flock to the city. It’s not as well-known as the Amazon, but the Pantanal, the planet’s largest wetland, harbors the greatest density of fauna in South America within its network of verdant marshes and river trails. The more than 1,000 species—including stalking jaguars, flamingolike spoonbills, and mohawked tapirs—are concentrated in an area in Central-West Brazil the size of Kansas. Before now, limited transportation infrastructure made them difficult to come and see. On new itineraries from Red Savannah, though, travelers can sail through the tributaries of the Paraguay River on the region’s first luxury expedition ship. The M.V. Peralta has 10 glass-fronted suites, an upper-deck plunge pool, and Zodiac rafts for deeper explorations throughout the floodplain. Or travelers can touch down on a 28-seat private jet courtesy of TCS World Travel, which is adding the region to a trip designed to hit the many highlights of Brazil. When to go: During the dry season, from May to October, you’ll maximize your chances to see jaguars, furry capybaras, and many, many butterflies. When not to go: The wet season, from November to April. The plains are flooded—and that means mosquitoes. This summer, tackle two big bucket-list items on one vacation. On July 2 a total solar eclipse will dazzle northern Chile—whose clear skies and lack of urban light make it one of the world’s best stargazing regions. View the show from the Elqui Valley, where the boho-chic CasaMolle hotel recently opened, and local wineries include Tabalí and Falernia. From there it’s just a 90-minute flight to the otherworldly Atacama Desert. Boutique travel company Upscape is offering a five-day itinerary that includes eclipse-viewing from a deluxe tented camp in Elqui, combined with an overnight in Santiago. Members-only travel club Prior has a two-week trip that runs from Patagonia up to Atacama, with a stop for skywatching at a mobile camp in the Araucanía lakes region. And the high-end group tour specialist Intrepid has introduced an 11-day journey with “star” astronomer John Mason. Book quickly; opportunities like these may truly come once in a lifetime. When to go: In extreme environments such as the Atacama, it’s smart to plan your trip for the milder spring and fall months. (Remember the seasons are inverted here if you’re coming from the northern hemisphere.) But this year, the eclipse warrants a notable exception. When not to go: Even the world’s driest desert has a rainy season: It spans January and February. Expect below-freezing temps come June, July, and August. Whom to call: Emmanuel Burgio of Blue Parallel. There are more penguins than people in this remote British territory near Antarctica. Still, the archipelago is better known as the site of a 1982 war between the U.K. and Argentina, which continues to claim sovereignty and calls the islands the Malvinas instead. With tensions between the governments easing, the Falklands are slated to become more accessible. Rather than arrive on a cruise liner—or by nabbing an expensive seat through the Royal Air Force, which runs a semiregular flight from a military base outside London—you’ll soon be able to fly in on Latam Airlines via São Paulo. Also making it easier to explore the windswept islands are nature-focused, land-based tours from Intrepid Travel. Visitors stay in comfortable lodge-style accommodations in the capital of Stanley, a onetime cargo service center that’s become a surprisingly robust adventure hub. Surrounding the town are rugged landscapes for trekking, wide grasslands for four-by-four rides, and unexplored beaches filled with elephant seals—and all those cute, waddling birds. When to go: October to March, when the weather is at its warmest and the wildlife-spotting is at its best. Plus, drier and clearer skies make ideal conditions for photographers. When not to go: April to August, when the days are cold, dark, and wet. and decks, white marble fixtures, and floor-to-ceiling windows. A dramatic 100-meter infinity pool—thought to be the longest in the region—cuts from the lobby all the way to the shore, while the two restaurants showcase the island’s famous spices. By next year, the resort will gain competition from an all-inclusive Royalton and Kimpton’s Kawana Bay Resort, a glass-fronted, jungle-wrapped follow-up to the company’s red-hot hotel in Grand Cayman. Plus, getting there just got easier: American Airlines now has direct flights to Grenada from Miami, and Air Canada is making the five-hour trip from Toronto. When to go: January to mid-April is high season for a reason—you’ll have the best chance for cloudless, sunny days. When not to go: Steer clear of hurricane season, from June to November, along with the overpriced winter holidays. Travelers en route to Malaysia’s idyllic islands usually bemoan a pit stop in the chaotic capital; now, with Kuala Lumpur upping its hospitality game to rival those of Singapore and Hong Kong, a layover here is part of the fun. The evolution started with some much-needed contemporary luxury hotels, including the city’s first Four Seasons (the third tallest hotel in the world). Equally impressive is the 253-room RuMa Hotel and Residences, which opened in December with a cantilevered deck and infinity pool that offer one of the best views of the Petronas Towers. About that skyline: This year it welcomes the Exchange 106, slated to be the tallest building in Southeast Asia, as part of the emerging Tun Razak Exchange financial district. The culinary scene—once dominated by hawker stalls—has been elevated, too. Saint Pierre, a popular French restaurant from Singapore, serves Asian-accented bistro classics such as pan-fried foie gras with lychee and apricot. And Dewakan is driving traffic to an unassuming university campus for slow-cooked red snapper with temu (a root spice) and other dishes that spotlight indigenous Malaysian ingredients. When to go: It’s always relatively warm, but May to July are the driest months. Alternatively, go during Diwali (November) or Chinese New Year (February) for especially festive vibes. When not to go: Rain can be an issue here, particularly in March or April and from September to November. As travelers with time and money increasingly seek isolation and quietude, the way-north is seeing an uptick in year-round tourism. Yet Norway, the postcard for arctic bliss, hasn’t been capitalizing on that trend. That’s largely because there are few places to stay; above-average national wages make high-touch hospitality a pricey business proposition. Slowly but surely, entrepreneurs are finding workarounds—namely, by creating intimate resorts with small staffs. Lyngen Lodge, famed as a place to view the aurora borealis, has eight bedrooms beneath a thick grass roof, and it’s only 65 miles west of charming Tromso. Farther afield is Finvag, a lovingly refurbished boarding school set on its own fjord—with its own small fleet of boats. This year the country estate Amot, just north of Bergen, will transition from exclusive-use villa to boutique hotel—meaning you can book one of its eight suites instead of the whole home. It makes a great base for fishing and kayaking adventures in the Tolkienesque landscape of mountains and glacial rivers. In Oslo the new jazz-inspired Amerikalinjen hotel is your jumping-off point to remote locales such as the jagged crags of Lofoten or even the polar bear-filled island of Svalbard, both above the Arctic Circle. And more developments are on the way, as Marriott International Inc. brings its youthful Moxy brand to Bergen, and Aman Resorts founder Adrian Zecha considers a few tundra-bound projects. By the time Svart, the world’s first energy-positive hotel concept (fueled by geothermal and solar power), opens in 2021, Norway will have completed its five-star transformation. When to go: If you want more daylight hours than you’ll know what to do with, visit from May to August. When not to go: From October to January, the weather is cold, wet, and dark. Of course, these are also the prime months to see the Northern Lights or ski the fjords. The earlier in he season, the less treacherous.